It may be hard to believe, but most of the well-known travel guides to Turkey do not mention Stratonicea. These unique ruins were once an ancient Carian city that was inhabited continuously from the 4th century BC to the 20th century AD. A walk among the ruins of the now abandoned city gives travellers a feeling of mystery and enchantment. The oldest historical records that mention the settlement in this area come from the Hittite period. In this time the settlement was called Atria. Classical authors such as Herodotus, Strabo and Pausanias inform that before the establishment of Stratonicea there existed a Carian settlement known as Idrias or Chrysaoris (i.e. 'Golden Sword'). According to these historical sources this was the first Lycian town founded in Asia Minor. In the 6th century BC Idrias passed under Persian control. According to the assessment made by Athens in 425 BC, Idrias was supposed to pay annual tribute of 6 talents to the Delian League. This demonstrated the significance of this settlement. However, Idrias never joined the League and never paid this tribute. Stratonicea was founded in the beginning of the 3rd century BC as the confederation of several settlements surrounding Idrias. It was meant to be the major Carian city. Its inhabitants were of mixed origins: Anatolian and Macedonian (from the Seleucid army). The name of the city is derived from a Syrian princess called Stratonice. As a young girl she was married to Seleucus I Nicator, who was one of the Diadochi. Stratonice had borne him one child before her stepson Antiochus fell in love with her. Stratonice's reasonable and tolerant husband divorced her and subsequently she married his son. During the Seleucid reign Stratonicea joined the confederation of Carian towns i.e. Chrysaorian League. This is attested by the inscription from 267 BC. The temple of Zeus Chrysaoreus, where League's assembly met, was located nearby Stratonicea. Lagina, the second important religious sanctuary, was the place of goddess Hekate cult and veneration. Seleucids adorned Stratonicea with many magnificent buildings, but their rule finished in 197 BC when the city was ceded to the Rhodians. In 167 BC Romans declared the whole Carian territory free. From this moment starts the city's independent coinage, which lasted until the reign of the emperor Gallienus in 3rd century AD. In 130 BC Stratonicea played the central role during the revolt against the Roman Republic that ended after the siege and fall of the city defended by the self-proclaimed king Aristonicus. In 88 BC Stratonicea was conquered by the king Mithridates VI of Pontus who established his garrison in the city and married the daughter of one of the leading citizens. In 40 BC the city defended itself during the siege led by Quintus Labienus and his Parthian troops. The city remained unconquered, but as the revenge Quintus Labienus destroyed the nearby sanctuary in Lagina. The heroic resistance of Stratonicea gained it the gratitude of the Roman Senate and Augustus, the future emperor. Stratonicea was especially favoured by emperor Harian who even changed its name to Hadrianopolis. In Roman era the city flourished and the best-preserved structures, such as a theatre and Serapis temple, are dated to this times. At its peak the city was inhabited by more than 70 thousand people. When the Turks conquered Anatolia, their village called Eskihisar was built among the ancient buildings of Stratonicea. After the earthquake in 1958 the village was moved to a new location, because of the newly opened lignite mine. However, several families still live in their houses in the old location. The lignite mine operation damaged the part of Stratonicea necropolis. Currently there are some plans to close the mine and inundate its terrain in order to create an artificial lake. The existence of an ancient city in the Eskihisar area has never been a secret. In 17th century BC the travellers who visited this part of Asia Minor described the visible ruins and inscriptions. In 1743 Richard Pococke published a book A Description of the East, and Some Other Countries where he gave detailed descriptions of Stratonicea's theatre, bouleuterion and one of the gates. The first archaeologist to conduct systematic excavations in Stratonicea was Yusuf Boysal. His team revealed the most important ancient structures and prepared the first plan of the city. Currently the excavations and the restoration work in Stratonicea are directed by professor Bilal Söğüt from Pamukkale University in Denizli. The work is ongoing and new discoveries are made every season, eg. in 2010 the sacred spring that supplied the city with water was found. When we visited Stratonicea in 2012 the excavations continued with the participation of 50 scientists and student teams from 8 universities. The scholars focussed their attention on the theatre, gymnasium, necropolis and city walls areas. 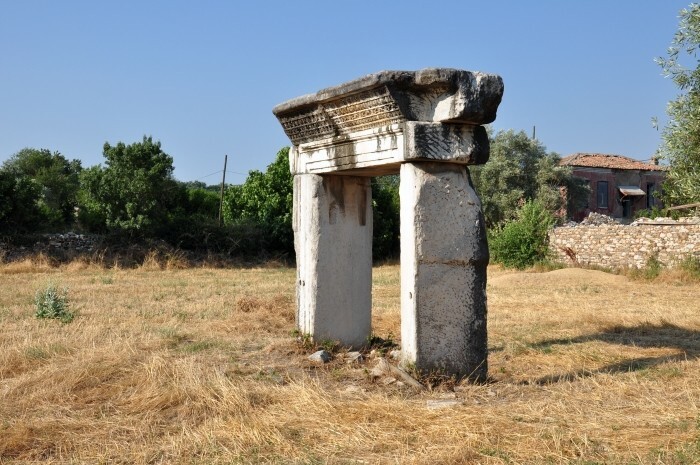 In 2012 more than 700 artefacts were found in the city and many of them were transported to the museum in Muğla. Moreover, the archaeologists reconstructed the colonnade along the western city street. The efforts are made to inscribe Stratonicea on the UNESCO World Heritage List. The collections of artefacts from Stratonicea are on display in many Turkish museums, i.a. in Istanbul, Bodrum, Milas and Muğla. Some artefacts remain in a local museum in Stratonicea. The attractiveness of Stratonicea for the visitors results from its unique mix of ancient buildings and abandoned Turkish houses. The city is situated on the plateau between the hills. The remains of the fortified acropolis can be seen on the hill in the south. The construction of Stratonicea was conducted on the basis of a grid plan invented by Hippodamus of Miletus. Despite the lack of archaeological evidence it can be assumed that the main alley led along the north-south axis with outgoing perpendicular streets that created the city communication grid. Stratonicea was surrounded by fortifications that encompassed the area of app. 1 square km. The walls were 3,5 km long and their width varied from 2.4 to 3 meters. Some parts of these walls are still visible as is the Hellenistic fortress in their north-east section. Stratonicea archaeological site is open for visitors and its most important structures have been clearly marked by information boards in Turkish and English. By car: Stratonicea is situated near the D330 route from Bodrum (distance: 74 km) in the west, through Milas (29 km) to Yatağan (10 km) in the east. To get to Muğla, that is the centre of the district, it is necessary to drive to Yatağan and travel further 27 km by the D550 route. The turn-off to Stratonicea from the main road is clearly sign-posted. The nearest accommodation options are available in Yatağan where the best choice is Hürtur motel (tel. 0 90 252 572 68 44) at the Petroturk petrol station on the road to Muğla. It is also possible to find accommodation in Milas or Muğla.